On June 1, 2010 Greg Kolodziejzyk will attempt to pedal a custom-designed, state-of-the-art pedal-powered boat 3,000 miles from Victoria, B.C. Canada to Honolulu. And he'll be taking Kimberlee's Bikes for Kids along for the ride. 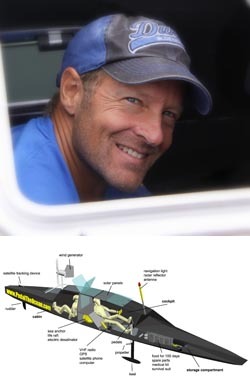 "I am planning on pedaling my specially made human powered boat, christened 'WiTHiN', across the Pacific partly because it's never been done before, and partly because it is my hope that both kids and adults will become inspired by what I am able to demonstrate," says Greg. "We can all take responsibility for our own heath by incorporating human power into our lives. For every mile that I pedal across the Pacific Ocean, Kimberlee's Bikes for Kids will hopefully be able to donate one bicycle to a deserving child who can't afford one. When someone sponsors a mile of the Pedal The Ocean voyage (for just $50!) they're putting a bicycle in the hands of a deserving child and playing an important part in our fight against sedentary lifestyles and the childhood obesity epidemic. If I make it to Hawaii I will have traveled 3000 miles which, with enough sponsorship, will mean 3000 bikes for 3000 kids!" Greg is no stranger to human endurance. In 2006 he earned his first world record by pedaling a human powered vehicle 647 miles around a racetrack in one day. Two years later he set a world water record by traveling in a boat by human power 152.3 miles in 24 hours. His Canada to Hawaii attempt will be performed in his specially designed watercraft that measures 30 feet long by 3 feet wide, weighs 455 lbs, and features a wave piercing hull, a watertight sleeping cabin, cockpit, and two storage compartments. WiTHiN will carry enough dehydrated food for 100 days at sea. Fresh water will be supplied via electric desalination plant powered by solar panels and a wind generator. "What an incredible record attempt for Greg," says Dan Gindling, president of Kimberlee's Bikes for Kids, a non-profit foundation that helps underprivileged children realize their dream of owning a new bicycle. "Greg could have just put all of his effort into training for his endeavor, but instead he has jumped headfirst into fundraising for Kimberlee's Bikes for Kids. We look forward to working with Greg and thank him for his generosity."